October 13, 11:00 am - Finished with my mid-sem and proceeding towards my Scooty, I heard a gang of first years shouting, “SHAHRUKH KHAN is coming to DB Mall.” Blimey!! I thought, isn’t he like, 45 years old now? Why is everybody raving about somebody who is more likely to adopt them than marry them? It’s not like this was the first time a film-star was coming to Bhopal, not after Prakash Jha’s Rajneeti and Aarakshan, no Sir! Overlooking our misgivings, my friends and I decided to be a part of the mass hysteria and we reached the venue by 11:30. “No entry without passes”, one of the Black Cat security personnel confirmed. We tried calling people who could get us some, but with no such luck. They were either unavailable or busy. An hour passed, and only two of us were left now. The others went home, vexed by the heat and the trickling sweat. Reluctant to go before Shahrukh’s arrival, we sat down in the middle of the road, while the onlookers passed us, commenting on our present state. “Anything for Shahrukh” was the attitude we carried throughout the euphoria and jubilation. 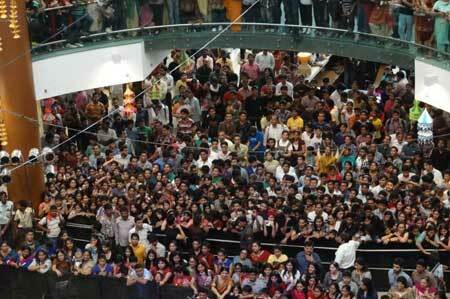 Time crawled and barely half an hour was up when the security officials had taken charge of the crowd. People were running in our direction, followed by guards brandishing lathis. Panic-stricken, we hid ourselves among a group of women not wanting to be victimized by the raining stones. The chaos died down and brought us back to our senses and we decided to let go of the SRK craze. There were better things to do in life than getting crushed in a stampede. 1:30 pm - we went to relax inside a cafeteria packed with the SRK fans. The lone LCD in there was constantly showing songs from his movies and Ra.One previews. Ignoring the loudspeaker could not make us ignore the fact that the public here was present for King Khan only and continually talked about him and the promos. We decided to become a part of the crowd again. He had already arrived by then and we were dying to get a glimpse of him, even at a distance of 1000 feet from the balcony of the Mall. After 3 more hours of waiting and ducking the lathis and stones, somebody coming out of the Mall told us that SRK already left! Still not in mood to go back home after 7 hours of waiting and 7 missed calls from home; we waited for the crowd to disperse when it suddenly roared madly again. YES!!! 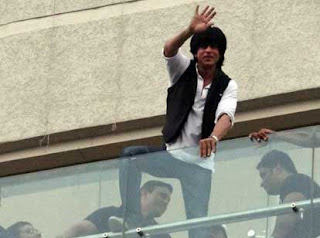 IT WAS SRK ON THE BALCONY!!! No kidding, 7 proved to be the magic number! 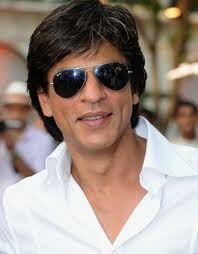 For the first time in my life, I saw a film star, even though it was from a distance, and that too SHAHRUKH KHAN! 15 minutes, he stood there trying to please each and every person in that gathering, sometimes dancing, at times giving his signature pose, waving at the crowd in every direction possible. We were not less than 200 meters away from him and my friend had already started waving at him like a maniac. 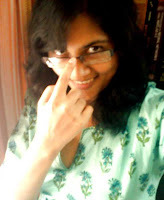 I saw what she was doing and as I focused my attention back on him, I saw him return the gesture. For a moment I couldn’t believe what had happened. Those 15 minutes washed away all the fatigue of waiting wearily to get just one glimpse of him. I didn’t get any sleep that night until I wrote this down and narrated this incident to almost every single friend of mine who was an SRK fan. The insanity for the name SRK proves the very statement made by Shahrukh Khan himself, “I am not Shahrukh Khan; rather I work for the brand Shahrukh Khan.” Best wishes for Don 2. P.S. I am going to watch it first day first show. I eat when I am bored and I live by the quotes that explain exactly what I am going through. I fancy reading Archie comics for the love of my favourite character Jughead Jones and I tend to get attracted to guys with a persona like him. I am a loner and at times I search for lonely spots where I can just sit and daydream.